PALEO JAY SMOOTHIE CAFE: Paleo Quick Tip of the Day #99 How to Go Paleo and Thrive! Paleo Quick Tip of the Day #99 How to Go Paleo and Thrive! 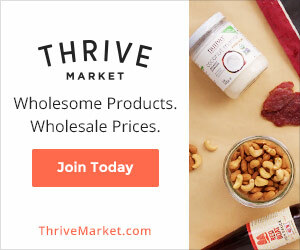 Thrive Market is an online wholesale buying club- kind of like Amazon Prime meets Sam’s Club or Costco, only healthier and better. Organic, real food products at true wholesale prices! You sign up for free with a 30 day trial, with 25% off of your first order- this is in addition to the already low prices, which are already 25-50% off of retail! Any time during the 30 days, you can “become a thriver” by buying a membership for $5 per month, or $60 per year. The average to pay this off in savings is in just two orders! And best of all, this membership into top quality, paleo types of foods is shipped directly to your door, in amazing condition because they pack it so well, post paid for any order over $49.95! In addition, for every purchased membership, Thrive gives away a membership to a food-insecure family from a neighborhood without access to wholesome, organic foods. This segues into my previous statement very well indeed! The number one thing you need to do to achieve everlasting health and wellness, fitness and leanness, is to only eat wonderful, nutritious, nature and God made foods! That is rule #1 of Paleo Land!! So, if you get a trial to Thrive market by clicking on the link at www.paleojay.com, you can immediately start on the yellow brick road path to health by making an order on line with no membership fee for the first month, AND a 15% discount on your first order!! Throw that stuff in the garbage- it is not fit for consumption! Don’t give it to the homeless shelter, or a pet, or even wild animals- well, I guess wild animals are ok, since birds can digest grains... just don’t give it to mammals!! OK, now you have a pristine kitchen, just waiting for REAL FOOD to arrive! Make your order- make sure it is over $50.00, and there will be no shipping cost! (Don’t forget you also get 15% off of the already 25-50% off, so this should be a BIG, and INEXPENSIVE order for all that you will get). And, all of Thrive’s stuff is TOP QUALITY PALEO FRIENDLY! Oh, don’t forget to throw out your toxic cleaning products as well, and your sodium lauryl sulphate laden soaps, shampoos, mouthwashes and toothpaste- this mean they are loaded with chemical, petroleum derived industrial cleaners instead of good natural SOAP! Also, commercial toothpastes are nightmares that are loaded with toxic fluoride, and again, sodium laurly sulphate that makes it lather up real nice, giving the ILLUSION that it is cleaning your teeth. It’s NOT. Also, the glycerine in these standard toothpastes will prevent your teeth from “remineralizing”; that is, keep them from repairing themselves- did you know that teeth can actually put minerals back onto your teeth that have eroded, just as it rebuilds muscles you have broken down through the damage of exercise, making them stronger?? It can, if you keep that damn glycerine in standard toothpastes AWAY from your teeth! SHOP BY PALEO- all of your selections will be filtered to the Paleo lifestyle!! You don’t have to drive anywhere. You don’t have to put gas in your vehicle. That’s all paid for you- AND you are getting a huge discount on top of it all- no hassle, no trouble- just browse online at thrive and place your money and health saving order! You will love putting these healthy substitutes into your cupboards in place of all the CRAP that used to be there! And all so convenient and easy. So healthy, and all with the ability to utterly transform your life and health for the better! And CHEAPLY- did I mention THAT?? This really is a deal-changer. Take back your life and health, get the body you have always wanted, easily and without having to drive here and there, searching for what you need, all at high prices. I’ll see you on the other side, my lean and healthy paleo friend! Take photos, before your order and one month after- you won’t believe the results!